This is a wonderfully sweet romantic story that touches your heart; pulls at it, breaks it, then puts it back together again! Be prepared to get emotional! In the beginning, we get an insight into the lives of Josie and Kyle and what ultimately led each of them to the town of Torey Hope. Josie has felt unloved and unwanted her entire life. She has no self-worth or confidence in herself, and she knows she has to get away and start her life again. Devastated by a personal tragedy, Kyle’s life is in a “black hole.” He decides he has to get away and accepts an offer from his old school friend. He and Josie are on separate journeys to Torey Hope, but their paths are about to cross and change them forever. When they meet, they hit it off and become close friends, both recognising the pain the other is suffering. They are there for each other in every way as friends; however, a different kind of feeling slowly emerges which goes beyond just being friends. 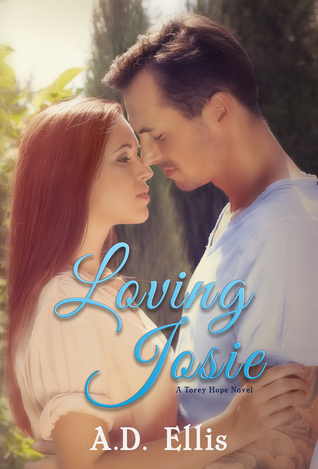 As Kyle’s so damaged and broken by tragedy, he suffered telling Josie he can never love again. He can’t offer anything but friendship but the heart wants what the heart wants. With a nudge from a very unlikely source, Kyle realises Josie is for him. Is he too late? Someone is watching Josie and hell-bent on destroying any happiness she has found. Can these two lost broken people finally have happiness and love together or once again, will it be cruelly snatched away? I totally fell for the characters in this book. Torey Hope sounds like my kind of town! It was easy to love Josie … soft, gentle, caring and loving even after everything she had been through. And Kyle! A hot tattooed broken man who slowly comes back to life thanks to her. The passion and connection these two have is plain to see and the story is full of heart-breaking, tear-jerking, sweet tender moments that make you feel connected to these two protagonists. I did not want to put this outstanding read down once I started! Beautifully written and from both points of view, I highly recommend this book!